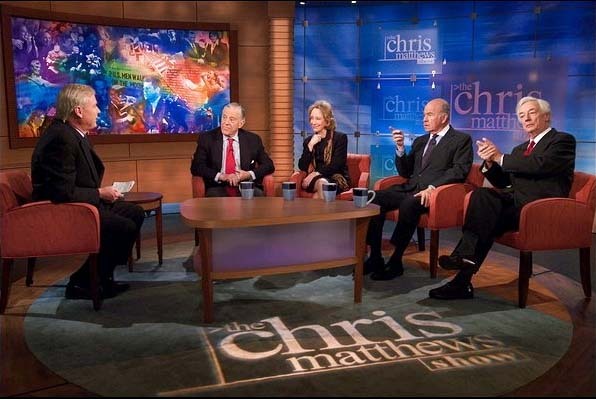 NEW YORK –- May 13, 2004 -– “The Chris Matthews Show” outperformed CBS’s “Face the Nation,” ABC’s “This Week” and “FOX News Sunday” in households nationally for the week ending May 9, 2003. According to preliminary Nielsen Media Research data, “The Chris Matthews Show” delivered a 2.1 HH rating beating “This Week’s” and “Face the Nation’s” 1.9 HH rating and “FOX News Sunday’s” 1.3. “The Chris Matthews Show” has outdelivered CBS, ABC and FOX in households for nine out of the past ten weeks including one tie (1.8 for “Chris Matthews,” “This Week” and “Face the Nation” for week of 4/4). “Meet the Press with Tim Russert” posted a 3.7 HH rating for the week. Season-to-date (through 5/2) “The Chris Matthews Show” outdelivers “FOX News Sunday” and “This Week” in households, total viewers and the key demographics of rating adults 25-54 and adults 18-49. Season-to-date (through 5/2), “Chris Matthews” ties “Face the Nation” in adults 18-49. “The Chris Matthews Show” continues to be the fastest growing nationally broadcast public affairs program. Season-to-date, “Chris Matthews” is up 29% in total viewers, up 14% in the key demographic of adults 25-54, and up 40% in adults 18-49. Last week’s guests were David Gregory, Clarence Page, Cynthia Tucker and Katty Kay. “The Chris Matthews Show” is produced by NBC News and distributed in national syndication by NBC Enterprises. Nancy Nathan is the executive producer. NBC Enterprises is responsible for the global distribution and exploitation of NBC owned product, which includes foreign and domestic program syndication, strategic marketing and ancillary exploitation of owned product in home video, merchandising, licensing, music and publishing as well as strategic production and co-production alliances and co-ventures. NBC Enterprises distributes all NBC-owned programming worldwide. This programming includes all shows produced by NBC Studios, NBC News, CNBC and MSNBC output.